GATE MALLOW, GATE MIDLETON, CINEMA WORLD DOUGLAS, GATE CORK. Cards may be purchased from any till point at any of the Gate Cinemas; Gate Mallow (022-53282), Gate Midleton (021-4630066), Cinema World Douglas (021-4895959) or the Gate Multiplex (021-4279890). You must present your Gift Card at the beginning of the transaction. You can use this card as full or part payment of any goods at either of the Gate Cinemas; Gate Mallow, Gate Midleton, Cinema World Douglas or the Gate Mulitplex. The amount of your purchase will be deducted from the balance on the card. The Gift Card may be used to purchase either tickets or food products from the shop. The Gift Card may not be used when booking online or making phone bookings, it must be presented at the till. Gift Cards can be topped up by simply present the card at any till in a Gate Cinema to top up. The remaining card balance will be told to you by a member of staff when you use the card to make a purchase or top it up. Please protect this card as it contains credit towards your visit to the Gate Cinemas. The balance cannot be returned to you if it is lost or stolen. The Gate Cinemas are not responsible for any unauthorised use of this card. The value on this card may be used to purchase tickets or food products, it does not give the bearer the right to any preferential treatment over other Gate Cinema customers. This card cannot be exchanged for cash or other vouchers. This card is neither a credit, charge or cheque guarantee card. No change will be given, the balance remains on the card to be used for future purchases. If there is not enough credit on the Gift Card for a transaction the balance must be paid for in cash. Card issued by The Gate Multiplex, North Main Street, Cork. Use your loyalty card on every visit you make to the cinema to receive points, and you will soon have enough for a free cinema ticket or medium combo (medium drink of your choice and medium popcorn). 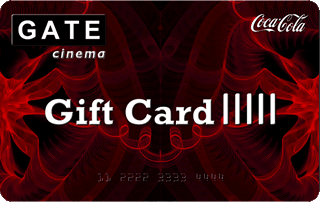 To receive your Gate Cinemas Loyalty Card, simply visit any of our Gate Cinemas; when you purchase a ticket from our shop you will be given a loyalty card at any till. One point will be awarded to you on your first transaction with your loyalty card. Your details; name, email address and phone number will be taken by a member of staff at the till to be entered into our database. 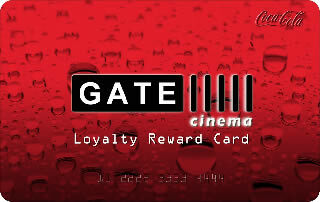 Your Loyalty Card may be used at any of the Gate Cinemas; Gate Mallow, Gate Midleton, Cinema World Douglas or Gate Cork. When you have collected 5 points on your Loyalty Card (5 visits) you will receive a free medium combo meal on your 6th visit. When you have collected 10 points on your Loyalty Card (10 visits) you will receive one free cinema ticket on your 11th visit. To collect your points, simply present your Loyalty Card at any till within either Gate Mallow, Gate Midleton, Cinema World Douglas or Gate Cork at the beginning of your transaction, minimum spend is €6.00 to receive points. Your Loyalty Card will be swiped at any till to receive one point per visit to the cinema. Points cannot be added once your transaction has been complete. You must present your card at the beginning of your transaction. Points will not be awarded if tickets are received by means of a Complementary Pass, Gate Voucher, or any other free or discounted ticket promotion. All free tickets awarded by the Loyalty Card are valid for any day and any time as chosen by you. This condition can be altered by The Gate Cinemas at any stage of the Loyalty Card duration. Tickets awarded through the loyalty card scheme cannot be transferred. By using and registering for your Loyalty Card you are agreeing to comply with all the Terms & Conditions of the Gate Cinemas as outlined on our website. The Gate Cinemas reserve the right to (a) terminate the scheme (b) withdraw or cancel the card on reasonable grounds or (c) alter or change the conditions of the Loyalty Card. Reasonable grounds include; abuse or attempted abuse to the scheme. This card is non-transferable and use is permitted only by the person to whom it has been issued. No cash alternatives are permitted. Your Loyalty Card cannot be used as a guarantee card or as a credit card. The Gate Cinemas Loyalty Card cannot be sold or traded in any way. Members can be removed from the Loyalty Card scheme at the discretion of The Gate Cinemas. Cards and points carry no cash value and may not be exchanged for any other offer or service. The Loyalty Card cannot be used in conjunction with any other offers.